Nathan Flomm (Larry David) is a marketing executive who sells his shares in an electric car company that is on the verge of going public, then becomes a laughing stock when the company enjoys huge success. To hide from the hordes of people who mock him for losing out on billions of dollars, he moves from California to Martha's Vineyard and changes his name to Rolly DaVore. He manages to build a quiet life over the next decade, working as a carer for an elderly woman and generally being a pillar of the community, but his tranquillity is shattered when his former business partner Will Haney (Jon Hamm) arrives on the island with his new wife Rhonda (Kate Hudson). Rolly very quickly decides that this is the perfect opportunity to wreak vengeance on the man who cost him a fortune. For most of the first act, Larry David appears with shoulder-length scraggly hair and a shamanic beard. 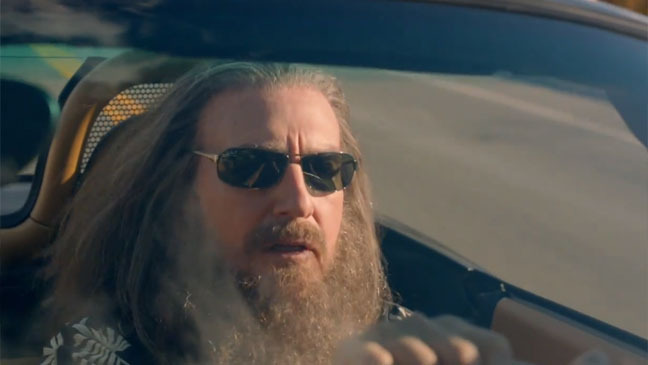 The main purpose of this, other than to make him look eerily similar to prolific Seinfeld writer and Borat director Larry Charles, is to set up the conceit of Clear History's revenge plot: even though they worked together fairly closely, Will fails to recognise Rolly because without the hair and the beard he looks completely different. This allows Rolly to get a job helping to construct Will's new McMansion with the hopes of then blowing it up, a plan he decides upon after watching the film version of The Fountainhead (making it arguably one of the least destructive acts ever inspired by Ayn Ran) with the help of a cadre of friends played by Danny McBride, Bill Hader and an almost unrecognisable Michael Keaton. As is so often the case with David's improvisational style, the best moments in the film come from the scenes and conversations which have next to nothing to do with the actual story, and it actually feels like an imposition when a character says something that advances the plot. Personally, I could happily watch Larry David and J.B. Smoove talk at length about whether or not there is such a thing as "dwarf racism" for hours on end, and far and away the most entertaining stuff in Clear History lies in the little interactions that arise from Rolly's by turns ingratiating and awkward interactions with the people around him. The flip side of that loose style is that there are plenty of scenes that don't pay off - though there are few that completely fail - and there is a lot of padding to get the film to feature length (though it doesn't suffer quite the bloat of, say, Judd Apatow's films, many of which use a similar approach). There are plenty of subplots - such as Rolly's frequent calls for the local diner to put napkins under their cutlery, his obsession over whether or not his ex-girlfriend (Amy Ryan) once gave blowjobs to Chicago (the band, not the great American city), and a brief sequence in which he tries to woo Rhonda as part of his overarching revenge - which serve no real purpose. They have their moments, but there is none of the precision of David's best work; that ability to take disparate threads and somehow corral them so that they collide in moments of gloriously bleak farce. In Clear History, it looks more like a bundle of strings, the majority of which are left hanging. That's not to say that Clear History is at all bad. It's actually pretty, pretty, pretty, pretty okay. It's frequently very funny, most of the cast are more than capable of keeping up with David's train of thought and occasionally derailing it to great effect, and the whole thing ambles along nicely. But it's also not a film so much as a bunch of ideas grafted onto a story. They are some pretty funny ideas, admittedly, but the need to keep things moving does limit the improv somewhat, and most of the purely story driven scenes feel very perfunctory compared to the ones of the cast trying to be as funny as possible. It's a perfectly fine diversion, but it also made me miss Curb Your Enthusiasm's relative tightness, considering that it had only slightly more laughs spread over an hour and a half than Larry David usually crams into thirty minutes.